Bonnie shares her home with Morley, Heather, her littermate brother, MacGregor, and half-sister, Katie. They can often be found sitting together on the windowsill watching the birds, or chasing each other from one end of the house to the other. 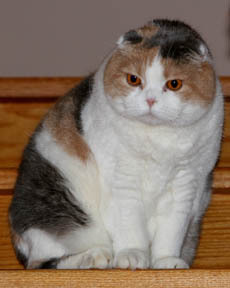 Bonnie attended their first show as a kitten in March 2002 in Ancaster, Ontario. Bonnie won Best of the Best Kitten in Show on the first day, and finished the show as Supreme Best of the Best Cat in Show. Way to go, Bonnie! 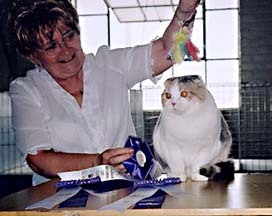 Bonnie achieved her Premiership status at the Acton CCA show in August 2002. At the CCA CNE Show in August, 2002, Bonnie finalled in every ring (8), which included 2 second-best rosettes. Among the Premiers, Bonnie received several Best Premier ribbons. She's a Grand! 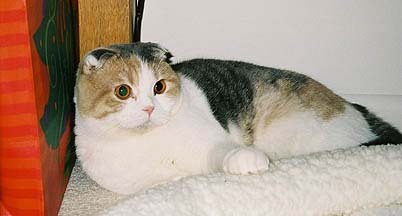 Bonnie obtained her Grand Premiership in CCA at the Ottawa show on October 12-13, 2002. Congratulations to Bonnie, and of course, to her humans, Heather, Morley & Jennifer. "November's cat is deeply emotional and should be treated with great care if harmony is to be established."